Mixed reality is now very much, well…a reality. Most gamers have dabbled in the fast-improving technology - and now Box has slashed the price of one its leading headsets to encourage more people to step inside the virtual world. The highly-acclaimed Acer Windows Mixed Reality Headset + 2 Motion Controllers has been reduced from £399.99 to £199.97. 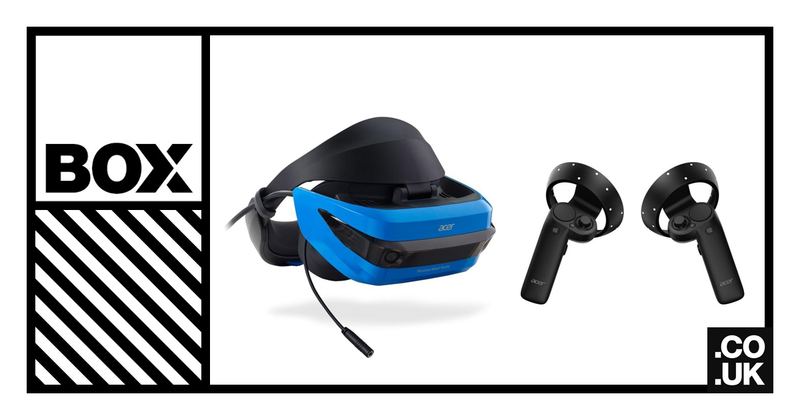 With a customer rating of 8.2/10 on our website, the Acer Windows Mixed Reality Headset delivers huge value for the price tag and is the prefect entry level headset for those wanting to experience VR without shelling out a month's wages - or even more. Unlike other VR systems, which require sensors installed around the room, the Acer Windows Mixed Reality works with inside-out tracking, giving you the freedom to use any room you wish and make the whole world your playground. It's easy to set-up and the headset, with its double-padded headband, is remarkably comfortable and easy to adjust. A major talking point of this headset is its clever flip visor. When something is happening in the boring real world, the visor can be easily lifted up, meaning the whole headset doesn't have to be removed. And it's not just your visionary sense that will be attacked with the Acer Windows Mixed Reality Headset. Spatial audio lets you hear sounds from specific locations, just like in the real world, and your advanced motion controller makes it easy to move through virtual spaces. The combined effect is a sensation where your virtual and physical worlds are in perfect sync, free of latency or distortion, for a phenomenal sense of presence. There are umpteen ways for gamers to escape the everyday and enter their unique world, with personalised virtual surfaces to choose from including travel, sports, culture, live concerts and time travel. There's also Minecraft and 20,000+ universal Windows apps. Ready to try VR? Click here to buy.